In the tradition of Robert A. Heinlein's juvenile classics, crafted with a modern sensibility. Jamey Barlowe has been crippled since childhood, the result of being born on the Moon. He lives his life in a wheelchair, only truly free when he is in the water. But then Jamey's father sends him, along with five other kids, back to the Moon to escape a political coup detat that has occurred overnight in the United States. Moreover, one of the other five refugees is more than she appears. Soon Jamey is front and center in a political and military struggle stretching from the Earth to the Moon. 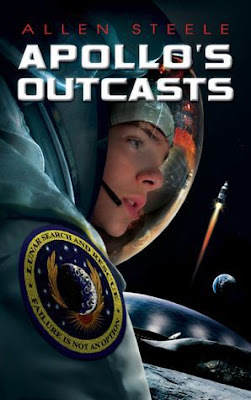 Apollo's Outcasts, a strong narrative with heart-pounding action and political suspense, will offer young readers a fresh taste of futuristic science-fiction. Allen Steele takes readers on an adventure that will call to the scientist in every reader as well as entertain. Jamey's story has several unique aspects that pull interest from a wide range of readers. Jamey was born on the moon, but raised on Earth and confined to a wheelchair. When his father sends Jamey and his sister to the moon, to protect them from the extreme plans of the new president of the United States, Jamey finds that life on the moon is a new experience in itself. Not only will Jamey, and the other children who fled with him, have to learn a new lifestyle, but Jamey will also have to get used to being able to walk on the moon, with his own two legs. The plot is tight with tension as soon as the story begins. Jamey wakes to find that the United States’ president is dead and the new leader, Lina Shapar, has declared a national emergency to search for and arrest the citizens who had recently opposed her. The flight to the Moon is an emotional experience for the group of kids who will have to leave their parents and venture to a place that may either become a refuge or another place of great danger. Steele does an excellent job of capturing these teens in such a confusing state where some, like Jamey and his best friend Logan, are determined to remain strong, and others are more prone to panic or disinterest. While at times Steele may get a little wordy when it comes to the history of Apollo, its purpose and all the facets of life there, and relations between the US and other nations, the colony has an innovative atmosphere that spills over the pages. The lines blur between fact and fiction as this city on the moon comes to life and the fate of Jamey and his friends rests on their ability to learn how to survive. Jamey is a fantastic character with a wise head on his shoulder. Joining the Rangers, who will serve to protect Apollo from possible invasion from the US, shows how much of an inspiring character Jamey is for all readers. Steele gives Apollo’s Outcasts a serious edge, but behind the danger and deceit rests a grand amount of hope, romance, and sense of togetherness. This story does not disappoint; it’s the perfect example of creative, adventurous science-fiction.